Study Skills You Should Be Using!!!!! a. You come late to school and don't get a chance to write down the assignments when the other students do. What do you do? OR You completely forget to write the assignments down because you were spending too much time getting other work done... or talking to friends... or thinking about a friendship problem... or thinking about those yummy cinnamon rolls you had for breakfast. What do you do? Take the first 30 seconds of lunch to write them down- Again, I promise you will not faint from starvation if you don't eat for the first minute or two! If you finish your work early, during class, use the extra time to write down your assignments. Use your pack up time wisely... ASK ANOTHER STUDENT TO SHOW YOU THEIR ASSIGNMENT BOOK. Copy it down and make sure you understand what books and notebooks to take home. If you run out of time and announcements start, or afternoon prayer starts, take a second while others are lining up to be sure you have what you need! Don't leave the room until you have it! b. You get home and the assignments you wrote down are wrong. What do you do? 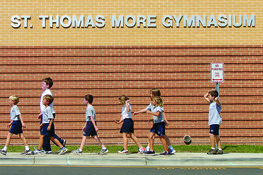 Log onto the school website at www.st-thomasmore.org! See if your teacher has a calendar of assignments on the class website. Ahh! You knew that emergency phone tree would come in handy! This is definitely an emergency! Call another student and ask them to read you the assignments over the phone. What are friends for? Just remember, if you use this option too many times, the other kids are going to figure out that you aren't very responsible. On the other hand, it looks a lot worse at report card time if you don't make the call and get your work done on time! c. If you always forget to write the assignments down, always write them down wrong or always leave books and notebooks you need at school, what do you do? Okay, take a deep breath! I can help you with this. Come see me in Rm. 24 in the lower school and I will give you some strategies to make the forgetting stop... it will also keep all those adults from being upset with you. Now that would feel great! In the end, remember, that you are responsible for getting your assignments written down correctly! It is no one else's job, but yours! If you are struggling with this, ASK FOR HELP! IT IS THE RESPONSIBLE THING TO DO!